Godzilla's Revenge A.K.A. All Monsters Attack A.K.A. What the F*ck am I Watching? Right now there are brutal things happening around the world. Whether locally in Ferguson or abroad in the Israel-Palestinian conflict, it seems like right now is not a shining moment for the human race. While I could (and at some point will) talk about these horrific events, I felt I needed a change of pace for a moment. So let’s talk about another Godzilla movie, that’s always fun! 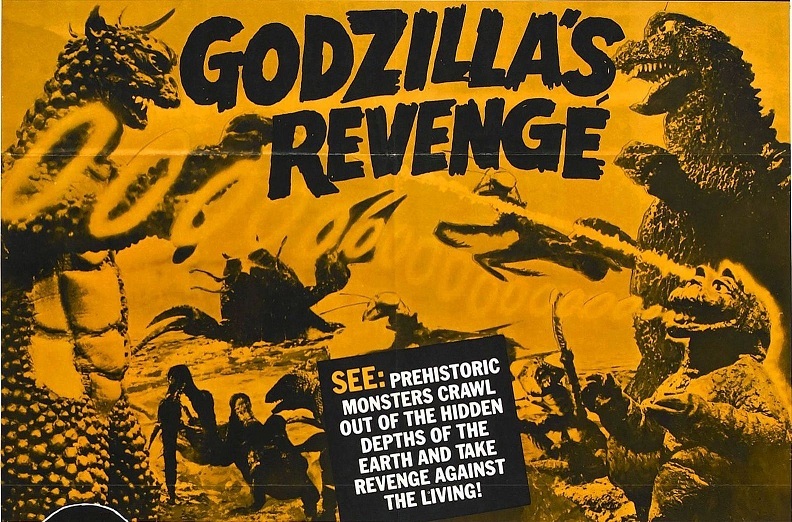 Winding the clocks all the way back to 1969 (teehee), today’s post focuses on the tenth film in the series, All Monsters Attack, later known as Godzilla’s Revenge over here in the States. This film was the immediate follow-up to 1968’s Destroy All Monsters, and is commonly known as the worst Godzilla movie ever made. Personally, I feel that this is an unfair label. Yet while Godzilla’s Revenge may not be the worst film in the series, it certainly is the most bizarre. Actually, even that may not be true. Bizarre in this case means that Godzilla’s Revenge is simply not like any other Godzilla movie ever made. “How could that be?”, you ask. Well, for starters: Godzilla is not ever really in the movie…. yeah, that is a little strange. But he’s right there on the poster! Everything about that poster is a lie. Godzilla’s Revenge is about a small boy overcoming parental neglect and bully problems. Oh, also he fights two burglars, pre- Home Alone style. Godzilla’s Revenge follows Ichiro Miki, he is our young protagonist living somewhere in Japan. Both of Ichiro’s parents are always working and the kid does not appear to have any real friends, aside from a young girl and an elderly toymaker. Worse than that, he has a bully: a slightly less small child whom he calls Gabara. That’s all okay though since Ichiro has his best friend, Minilla! Seen here are the two of them on a play date. Minilla is better known as the Son of Godzilla (originally from the movie of the same name). Minilla is also usually roughly 18 meters tall and, you know, a monster. In case it was not already apparent, Ichiro is not actually friends with the ‘real’ Minilla. Godzilla’s Revenge is a movie where all the monster portion takes place inside the imagination of a boy. While this sounds strange, it does not sound like a terrible idea. Godzilla had already appeared nine times at this point, so a new spin sounds like an inventive way to create a sequel. It probably didn’t help that this film came right after Destroy All Monsters, a movie which featured an awesome battle royale and more monsters than any prior Godzilla film. Yet for imagination, a lot of the monster footage is insanely familiar. Maybe Ichiro watched all the earlier Godzilla movies since the vast majority of monster footage in this movie is from prior films, namely Godzilla vs. the Sea Monster and Son of Godzilla. Yeah, those looking for a new movie in Godzilla’s Revenge only got about half of their wish. Couldn’t Ichiro imagine something cooler? 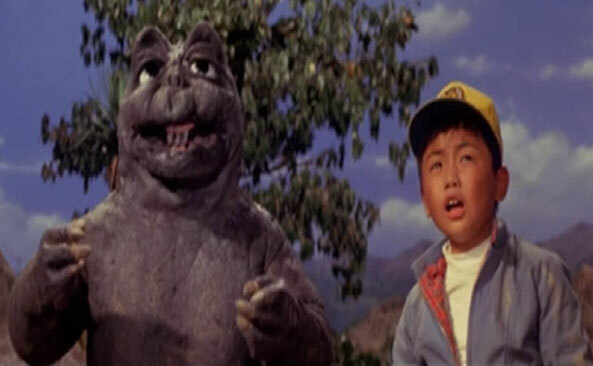 Ichiro talks to Minilla about bullying problems, something that the monster is all too familiar with. That is the bulk of this movie: dealing with bullies. Again, this does not sound like a horrible idea on the surface, just a puzzling one. The Godzilla series is, by its nature, a series about conflict so making an anti-bullying movie sounds challenging. Well, this movie is not anti-bullying. Minilla seen here solving his own bullying problem. Looks like it is going great! Yeah, Godzilla’s Revenge is the movie you show your kids to encourage them to fight. Great morals Japan! 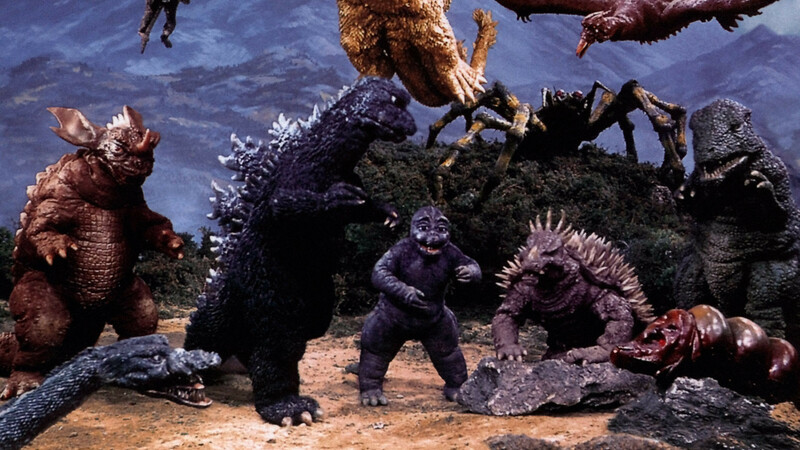 Minilla and Ichiro both need to stand up to a bully named Gabara, and both do… through fighting. Remember children, if someone you know is bullying you, tell an adult… unless that adult is Godzilla… just don’t talk to Godzilla. So there’s that. Sounds to me like Godzilla is being really judgmental. Oh, and remember those burglars I mentioned earlier? Well Ichiro gets kidnapped. Yeah, the kid left all on his own is abducted, but do not worry (and this is another moral of the movie) he knows his parents are busy and he needs to be more responsible. Yes children, if you’re alone and you get kidnapped: it is your fault. Well, maybe you should be more useful, child! On a serious note, I feel like scenes like this one are poignant and the film overall shows the potential of being a much better movie than it ever is. If it sounds like I’m describing a nonsensical plot that kinda jumps all over the place, it is because I am. Godzilla’s Revenge is not a particularly well put together movie. It is a combo of stock footage and questionable lessons for children. All that said, I do not think it is the worst Godzilla movie. Simply put – it is too different to really compare it to other films. There is no common structure here. Is the film entertaining: sure, in a really campy kind of way. Well, that’s already more than people can say about Godzilla vs. Gigan. This movie is just weird, from the imagination scenes to the talking Minilla to a kid fighting everyone to be more adult. Why was it called All Monsters Attack? No clue. Who is Godzilla actually taking revenge against, apart from bullies? Fair question. What the f*ck am I watching? Godzilla’s Revenge.